The evaluation of specific antibody production requires an in vivo model; however, species differences limit the utility of experimental animals for this purpose. For example, the lack of interspecies homology between the T cell receptor (TCR) repertoire and major histocompatibility complex (MHC) proteins precludes the evaluation of human vaccine responses in rodents. Humanized mice could be the tool researchers need to bridge that gap. In a recent publication, a team of pioneering humanized immune system (HIS) model researchers from the Central Institute of Experimental Animals (CIEA) describe a novel model that enables the evaluation of human vaccine responses in mice. Two common ways to generate immune-system humanized mice involve engrafting either human hematopoietic stem cells (HSCs) or human peripheral blood mononuclear cells (PBMCs) into super-immunodeficient models, like the CIEA NOG mouse®. Super-immunodeficient models encompass a subset of engineered immunodeficient mice harboring unique genetic properties that enhance the engraftment of human cells and tissues. HSC-engrafted NOG (huNOG) mice develop a functional human immune system that persists throughout the lifetime of the mouse. However, interspecies differences during immune-system development contribute to suboptimal T cell responses and antibody production in HSC-engrafted models. Therefore, models like huNOG have limited utility for human vaccine evaluation. By engrafting mature human PBMCs into NOG mice, many of the cross-species impacts on immune system development that affect HSC-engrafted models can be circumvented. 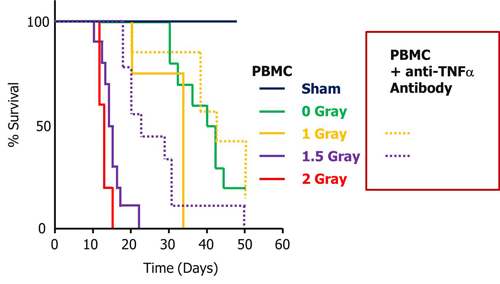 Despite this benefit, PBMC-engrafted NOG mice develop xenogeneic graft-vs-host disease (GvHD), which severely limits their lifespan and overall utility for vaccine research. To enhance and expand the utility of HIS models, investigators are increasingly turning to NOG variants engineered to express specific human cytokines. For example, huNOG-EXL, an HSC-engrafted NOG model expressing human GM-CSF and IL3, dramatically improves the development of human myeloid lineage cells compared to the non-transgenic huNOG model. Similarly, hIL-2 NOG and hIL-15 NOG express cytokines that specifically enhance human NK cell development from HSCs, making them useful tools for studying human NK cell-mediated antibody dependent cellular cytotoxicity (ADCC). This second generation of HIS models are beginning to overcome interspecies limitations that impede optimal human immune system engraftment, but novel cytokine transgenic models are still needed. Indeed, CIEA scientists and pioneers in the HIS-model field recently described a new cytokine-transgenic NOG model expressing human IL-4 (hIL4). Their data suggest hIL4-NOG mice can enable the evaluation of antibody-specific antigen production, illustrating how novel cytokine-transgenic NOG variants can be uniquely important research tools. Despite their potential utility for vaccine evaluation, PBMC-transplanted NOG mice develop GvHD, with onset that depends on donor-specific properties and the initial number of PBMCs engrafted. GvHD onset is also semi-tractable by treatment with specific immune-modulating therapeutics (Figure 1). radiation with, or without pre-treatment with anti-TNFa blocking antibody. Similar to clinical observations of GvHD patients, GvHD in PBMC-engrafted mice has been associated with increased quantities of Th1 cytokines. Hypothesizing that shifting from Type 1 helper (Th1) to a Th2 phenotype could prevent GvHD while maintaining humoral immunity, CIEA scientists generated transgenic NOG mice expressing hIL4, a representative Th2 cytokine. Compared to conventional NOG mice, which showed significant weight loss two weeks after PBMC-engraftment, similarly-engrafted hIL4-NOG mice maintained their weight over a twenty-week period of analysis. Thus, GvHD was effectively suppressed in PBMC-engrafted hIL4-NOG mice compared non-transgenic NOG. When the team of CIEA scientists analyzed the engrafted human T and B cells in hIL4-NOG, they observed dominant CD4+ vs CD8+ T cell proliferation. Supporting their initial hypothesis, long-term suppression of GvHD was associated with Th2-shifted CD4+ T cells in hIL4-NOG. Furthermore, conventional memory B cells increased in the PBMC-engrafted hIL4-NOG mice, whereas most of the remaining B cells in the conventional NOG counterparts displayed surface markers indicating B cell exhaustion. In further experimentation, the CIEA team investigated the utility of PBMC-engrafted hIL4-NOG mice for evaluating vaccine effects. Vaccination with a HER2 peptide successfully induced antigen-specific IgG production in PBMC-transplanted hIL4-NOG. Notably, IgG production was independent of the donor's PBMC haplotype, suggesting the HLA haplotype of donor PBMCs may not be relevant to antibody production following immunization. Collectively, the results suggest that PBMC-engrafted hIL4-NOG mice do not manifest GvHD and can be vaccinated to evaluate peptide-specific IgG antibody production. Moreover, donor HLA status (class II restriction) does not appear to require accommodation in this system. On a broader scale, these experiments support an important role for novel cytokine transgenic NOG models like hIL4-NOG in advancing important in vivo research capabilities.